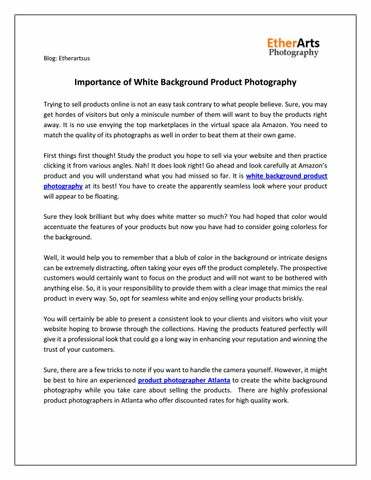 Importance of White Background Product Photography Trying to sell products online is not an easy task contrary to what people believe. Sure, you may get hordes of visitors but only a miniscule number of them will want to buy the products right away. It is no use envying the top marketplaces in the virtual space ala Amazon. You need to match the quality of its photographs as well in order to beat them at their own game. First things first though! Study the product you hope to sell via your website and then practice clicking it from various angles. Nah! It does look right! Go ahead and look carefully at Amazonâ&#x20AC;&#x2122;s product and you will understand what you had missed so far. It is white background product photography at its best! You have to create the apparently seamless look where your product will appear to be floating. Sure they look brilliant but why does white matter so much? You had hoped that color would accentuate the features of your products but now you have had to consider going colorless for the background. Well, it would help you to remember that a blub of color in the background or intricate designs can be extremely distracting, often taking your eyes off the product completely. The prospective customers would certainly want to focus on the product and will not want to be bothered with anything else. So, it is your responsibility to provide them with a clear image that mimics the real product in every way. So, opt for seamless white and enjoy selling your products briskly. You will certainly be able to present a consistent look to your clients and visitors who visit your website hoping to browse through the collections. Having the products featured perfectly will give it a professional look that could go a long way in enhancing your reputation and winning the trust of your customers. Sure, there are a few tricks to note if you want to handle the camera yourself. However, it might be best to hire an experienced product photographer Atlanta to create the white background photography while you take care about selling the products. There are highly professional product photographers in Atlanta who offer discounted rates for high quality work. 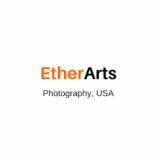 EtherArts Product Photography imparts the importance of white background product photography.